Fit Foodie Megha: Kobe Sizzlers and Co.– Sizzling since 1975 — Reviewed! Kobe Sizzlers and Co.– Sizzling since 1975 — Reviewed! Kobe is not a new name for sizzler lovers. With over 25 years, they are an icon in serving sizzlers. Though Sizzlers are their signature meal, they also have assortment of widespread range of salads, pastas, soups, rolls, pizzas, sandwiches to suit distinct palate. Best part is India’s first 70 mm stereophonic sound film had released in a theatre some forty years ago and just then not very far from there, Kobe was also born. A brand, a name just like 'Sholay'. Yes, that's the interesting part! They are celebrating 40 years of two sizzling icons, film Sholay and Kobe Sizzlers for which a special crated menu is there. 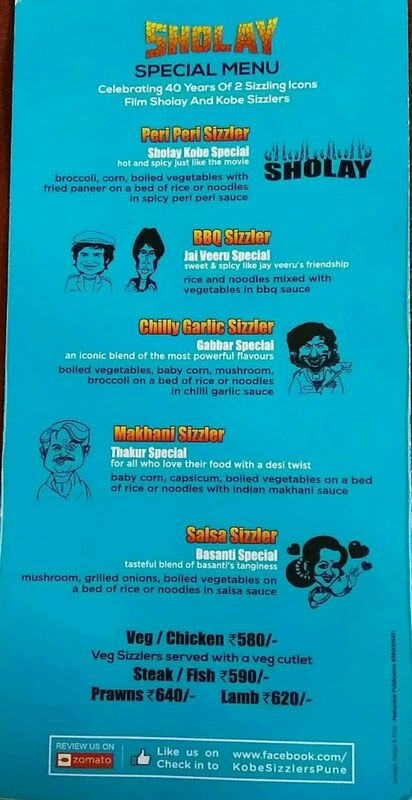 Quite enthralling names out of the menu – Sholay Special, Jai Veeru Special, Gabbar, Thakur and Basanti Special. It is like make your own sizzler with choice from variety of sauces, rice or noodles, paneer. One portion is enough for two people of average appetite. I went to Kobe Sizzlers, Aundh one which is almost 12 years old and was warm welcomed by the staff. Started my visit with the refreshing Watermelon Cooler. It was a quick treat for me to start my meal. As soon as the menu is presented, you can see the blue color single sheet attached to the regular one. The blue one is the Sholay inspired special menu. I am a spicy food lovers, so first thing that caught my eye was Sholay Kobe Special – Peri Peri Sizzler. Balanced hot and spicy one with broccoli, corn, boiled veggies, veg patty on bed of noodles in spiced peri-peri sauce. One can opt for the level of spice. Only thing that hit me was the aftertaste of burnt peas which was not going well with the sizzler. Feedback was given to the manager directly and he took it constructively. Though I must say, the veg patty was absolutely lip-smacking and tasted best with the sauce. #Recommended! Next on the menu was Chilli Garlic Sizzler, Gabbar Special! One of the most powerful character in the movie and so is the flavour of this one. Chilli and Garlic both have their robust essence but this sizzler was subtle made with same base of veggies, Paneer, mushrooms on rice this time with chilli garlic sauce.#Recommended! For a desi twist, I opted for Thakur Special, Makhani Sizzler. Again the same veggies, rice and makhani sauce. Sauce was well made, silky and tasted bit sweet and tangy. I loved it! Blended well with the rice and sauted veggies. #Recommended!